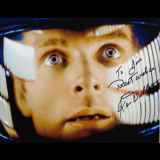 Keir Dullea is an American actor best known for the character of astronaut David Bowman, whom he portrayed in the 1968 film 2001: A Space Odyssey, and in 1984's 2010: The Year We Make Contact. Other film roles include Bunny Lake Is Missing and Black Christmas. New Response (Success): Received signed item. New Response (Success): Sent 1 Bluray-cover 1 request for autographed pho..